The Southwest is packed with strange landscapes, but The Wave offers a special brand of surrealism. No artist could have designed such a masterpiece of irregular simplicity. It’s a study in lines and curves and how they interact in space. 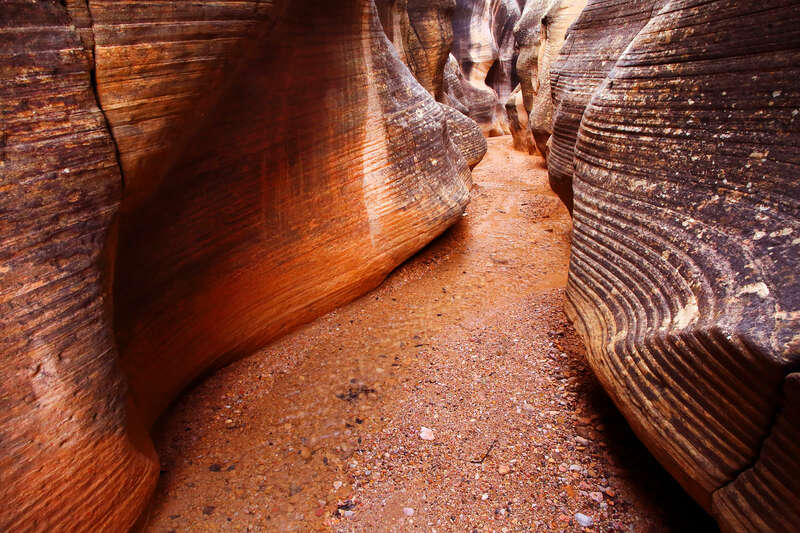 Sculpted corridors feed into an undulating bowl of brilliantly striated sandstone. The center of The Wave. It’s a gargantuan sandstone sculpture 190 million years in the making. About 190 million years ago, the world consisted of one ocean and one continent. The land that now makes up the southwestern United States was located in the western reaches of Pangaea. The Navajo Sand Sea stretched thousands of miles, across a region that dwarfs the modern Sahara. For about 10 million years, driving winds deposited mountains of sand, which piled up and marched inexorably across the landscape. The process, called Cross-bedding, left patterned layers of pure quartz sand more than 2000 feet deep. Eventually a warm, shallow sea inundated the area, and the great Navajo Sand Sea was obscured beneath new layers of sediment, ash, and more sand. For over 100 million years, it lay buried deep beneath the earth’s surface. 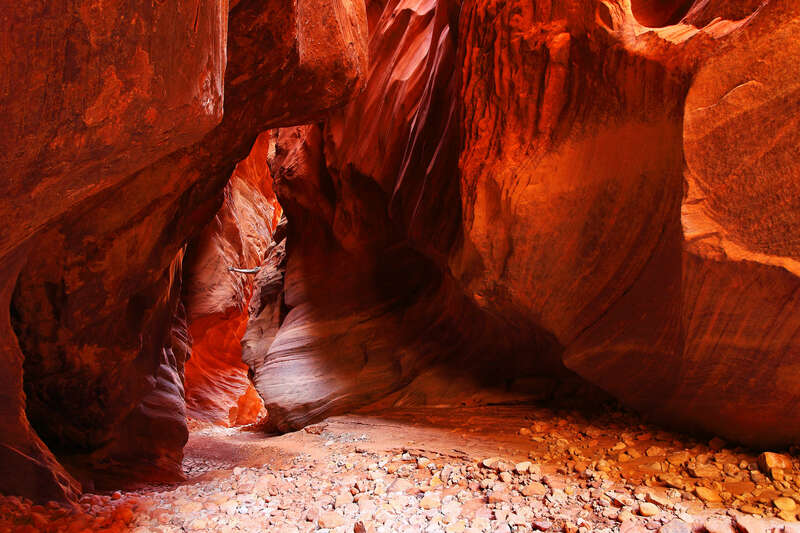 Gradually, it solidified into a layer of rock now called Navajo Sandstone. Very slowly, all these layers of earth were pushed upward, then carved away by wind, rain, rivers, and glaciers. The sliced-up remnants now comprise the Colorado Plateau: one of the world’s largest sculpture gardens. The Wave consists of intersecting sandstone troughs, which open into a small bowl. It’s perched on the far north edge of a formation called Top Rock. Photographs of the Wave adorn countless sitting room walls and computer screens. But in the end it’s a place that must be seen and experienced. The Wave itself is small–about 120 feet across at its widest point. The surrounding Coyote Buttes are a multicolored slickrock playground. If you’re lucky enough to visit, make sure to see some of the surrounding features, including the Second Wave, Top Rock, and Fatali’s Boneyard. From the Wire Pass Trailhead, walk east across the road and follow a short path down into Coyote Wash. Turn left into the wash and follow it to the northeast. Coyote Wash initially runs through open red-rock country with scattered pinyon pines. After about half a mile watch for a signed path to the right, which exits the wash. This part of the trail follows an old 4WD road to the top of a hill and across a field of sage, where you will find a register box. From the register, the trail continues east, then drops down into a wash. Cross the wash and approach the sandstone ridge to the east. Hike up this ridge to a cairned saddle. From this point onward cairns mark the trail, but they might be infrequent or inaccurate. 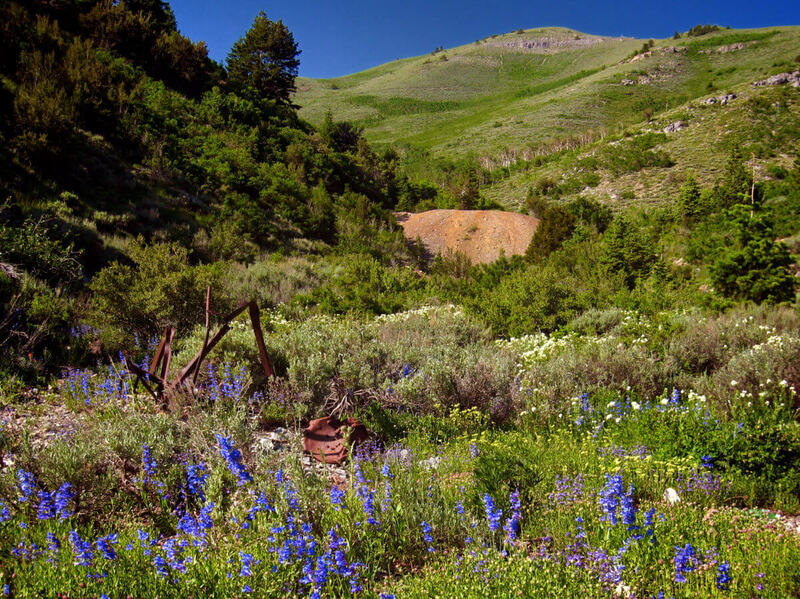 Occasional BLM signposts mark the trail; one can be found about 100 yards east of the saddle. Hike southeast down the backside of the ridge. After about 0.5 miles you will encounter a fallen barbed wire fence. Either cross the fence directly, or go around to the west. The light of a cold sunrise reflects off the cliffs of The Dive, just northeast of The Wave and the North Coyote Buttes. Look for a large sandstone mountain to the south. There is a deep, vertical crack or notch in the side of the mountain. Continue southward, aiming for the notch in the cliffs. After another 0.6 miles, you will cross another wash. Look for a group of multicolored domes on the far side of the wash. These, along with the sandstone formations to the right, constitute the Wave. Ascend a sandy path that leads up into the entrance of the Wave. Visitors are bombarded with the outrageous scenery of the Coyote Buttes. Sandstone teepees and striated bands of red and white compete with the cobalt blue sky for attention. From Kanab, follow highway 89 eastward for 40 miles. Turn south onto House Rock Valley Road, which is located between mile markers 25 and 26. Follow the road south for about 8 miles to the signed trailhead and parking lot for Wire Pass. A permit is required to visit the Wave, or travel anywhere within the North Coyote Buttes. Only 20 people are allowed to enter the area each day. Ten of these permits are issues via an online lottery system. The other 10 are issued via walk-in lottery. The lottery opens four months in advance. Applications are accepted for the whole month. Entering the lottery requires a fee of $5 per group. For each application, you can select up to three dates. The drawing is held the day after the lottery closes (i.e. on the first day of the following month). If you are drawn for permits, you will be notified via e-mail that day. If you are drawn, you will have to pay $7 per individual for permits. Walk-in permits are issued one day in advance. The drawing takes place at the Grand Staircase Escalante National Monument (GSENM) visitor center in Kanab. The visitor center is open from 8:00 a.m. to 4:30 p.m. every day excluding holidays. The lottery is held at 9:00 a.m.
From March 15 to November 15, permits are issued every day of the week (excluding holidays). During the rest of the year, weekend and Monday permits are drawn and issued on Friday. Visit thewave.info for more detailed information. When it comes to The Wave, this site probably contains the most comprehensive collection of information available on the internet. Another great resource is zionnational-park.com. The linked page contains another description of the hike, as well as more GPS coordinates for other landmarks within the Coyote Buttes North.